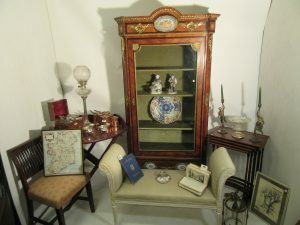 Cork silver, Georgian and later furniture and a pocket sketchbook with 30 watercolours from architects Henry and Arthur Hill dated 1884-96 all feature at the Lynes and Lynes sale in Carrigtwohill, Co. Cork on May 19. 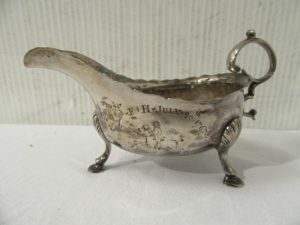 A sauceboat by the Cork maker Carden Terry is estimated at 200-400 and the sale will include silver serving spoons by makers such as Timothy Conway, James Salter and Richard Garde with estimates of 100-200. A Newcastle silver teapot made in 1798 by John Robertson II is estimated at 200-300. A 19th century oil after Murillo, The Holy Children with a Shell, is estimated at 600-1,000. 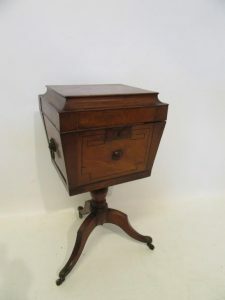 There is a selection of Georgian and later furniture including pieces made by O’Connell’s of Lavitt’s Quay Cork. 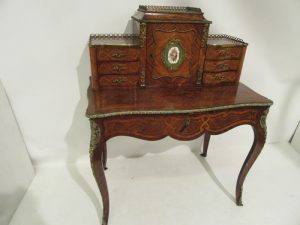 Some period furniture is in need of restoration and this is reflected in the estimates. More than 40 lots of books and a copy of the will of John Evan-Freke, 6th Baron Carbery (1765-1845) are included. The catalogue is online. A set of Georgian Cork 11-bar chairs from Charleston, home of the late Senator Trevor West at Midleton, is among the highlights of the Lynes and Lynes sale in Carrigtwohill, Co. Cork on March 3. 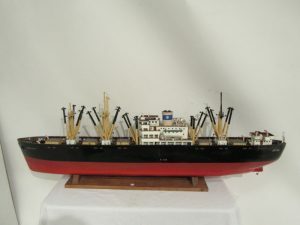 The auction of 470 lots an antique kingswood bonheur du jour, an Irish dining table with four original leaves, a Georgian fire bellows, R.H, Rylands 1824 History of Waterford and a 1933 handbook for travellers by the Japanese Government Railways, Tokyo. The catalogue is online. 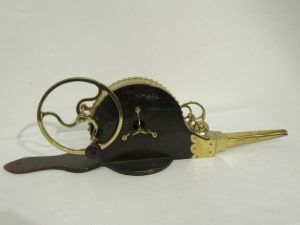 An Irish Georgian long case clock by William Maddock of Waterford and a telescopic Georgian dining table are among the prime lots at the Lynes and Lynes sale in Carrigtwohill, Co. Cork on June 24. Each is estimated at 3,000-5,000. 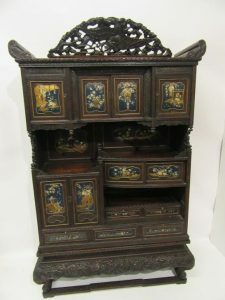 The selection offer includes a seascape by Edwin Hayes (1,000-1,500), a c1860 Chinese cabinet with lacquered panels (2,000-4,000), a set of Cork 11-bar dining chairs (1,500-2,000), a large wing back armchair (1,000-1,500) and an antique cast iron garden seat (1,000-1,500). 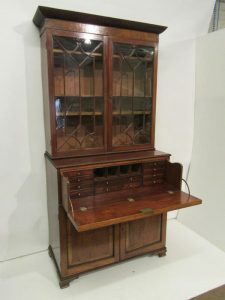 Auctioneer Denis Lynes reports that there is already interest in a Georgian sofa table (400-600). 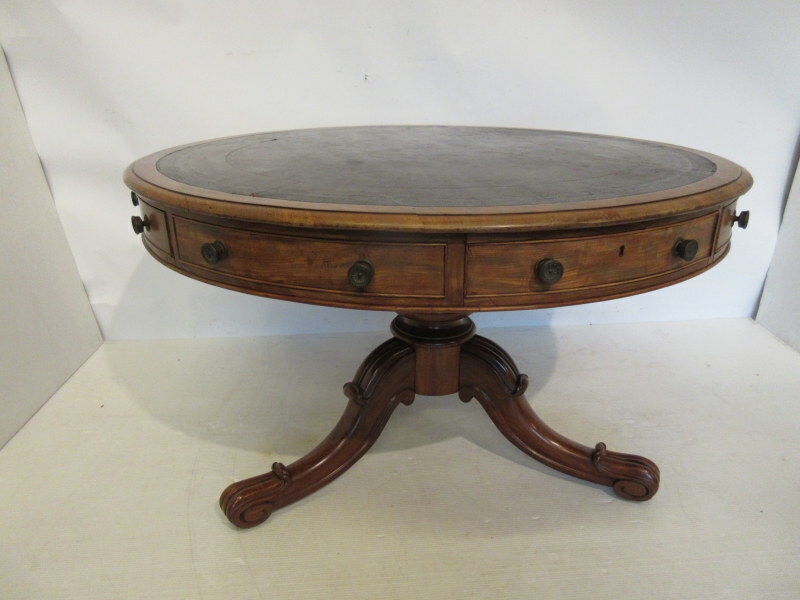 Also typical of Cork furniture are lots 255 and 256, a pair of hall chairs and a cellarette on tripod base. Each has a low estimate of 100-200. 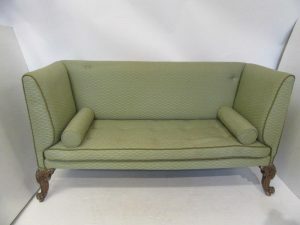 Other lots include a pair of rare official standard brass pint measures (100-200), a neat Georgian window or hall seat (200-400), a 19th century couch (200-400), an Irish Georgian stool with needlework drop in seat (600-800) and a pair of old terracotta chimney pots (40-80). There are GAA programmes and medals, a Guy’s Munster Directory, an abstract polished steel sculpture, an oil on canvas by Anthony Ruby entitled The Jolly Gluttons and a silk screen limited edition Led Zeppelin Stairway to Heaven print. An 18th century marble fireplace will be the centrepiece of the sale at Lynes and Lynes in Carrigtwohill, Co. Cork on March 25. 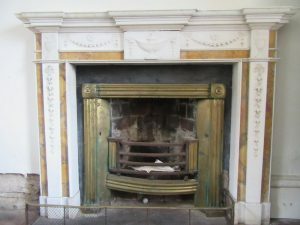 The Irish Georgian breakfront Carrara and giallo antico marble fireplace is in original condition and complete with brass inset grate. It is estimated at 20,000-30,000. 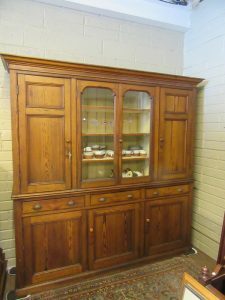 Antique Cork furniture includes a Regency secretaire bookcase (3,000-5,000) and four early nine bar chairs (400-600). 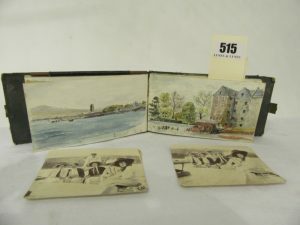 A Killarney wood tray inlaid with scenes of Muckross Abbey has an estimate of 150-250. 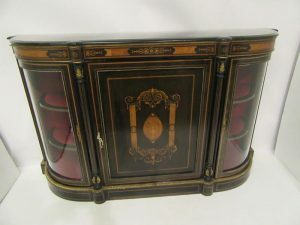 There is a large collection of antique furniture and collectibles. The auction will include a lifetime collection of GAA hurling and football programmes to be sold in over 60 lots. 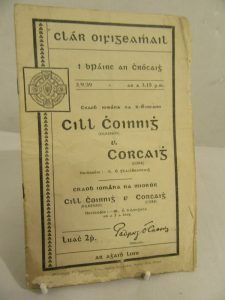 The 1939 All Ireland hurling programme in which Kilkenny beat Cork is estimated at 500-700. This is a 12 page booklet complete with songs and ballads. There are match programmes from the ’40’s, ’50’s and ’60’s with estimates from 20 upwards. The catalogue is online. Here is a small selection. Auctioneer Denis Lynes with a collection of sporting memorabilia. Sporting memorabilia always creates considerable interest at auctions in Ireland. 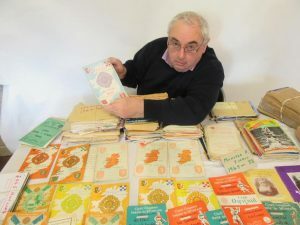 Auctioneer Denis Lynes will offer a lifetime collection of GAA hurling and football programmes will feature at the next Lynes and Lynes sale in Carrigtwohill, Co. Cork on March 25. They are currently being catalogued. He expects considerable interest. 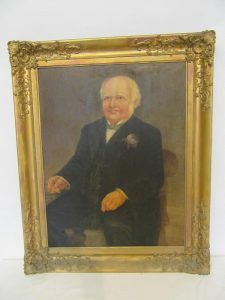 Family portraits, miniatures, engravings and furniture from the Hingston family, who lived at Horsehead House at Passage until the 1960’s, will feature at the sale by Lynes and Lynes in Carrigtwohill on November 26. There is, for example, a fine Cork Regency mahogany dining table and a set of 14 Georgian Cork six bar chairs. Each is estimated at 4,000-6,000. 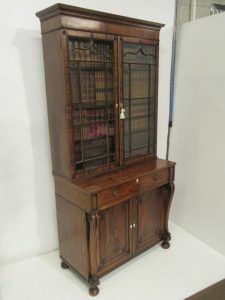 A Georgian Cork brass inlaid secretaire bookcase is estimated at 1,000-1,500, a Georgian side table with Greek key decoration always known as the lamp table when it stood in the hallway at Horsehead, is estimated at just 400-600 – (update: this made 570). 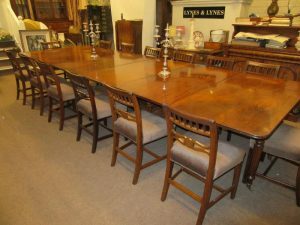 An Irish antique dining table with four additional leaves sold for 6,400. 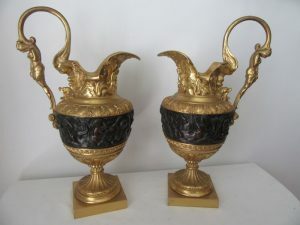 This pair of antique bronze ormolu ewers has created quite a stir at Lynes and Lynes in Cork. 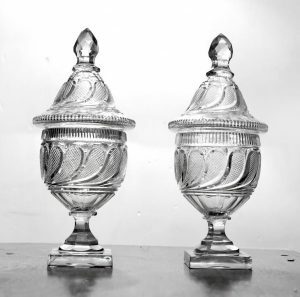 They are due up at auction at a house sale in Glounthaune, Co. Cork on July 23. 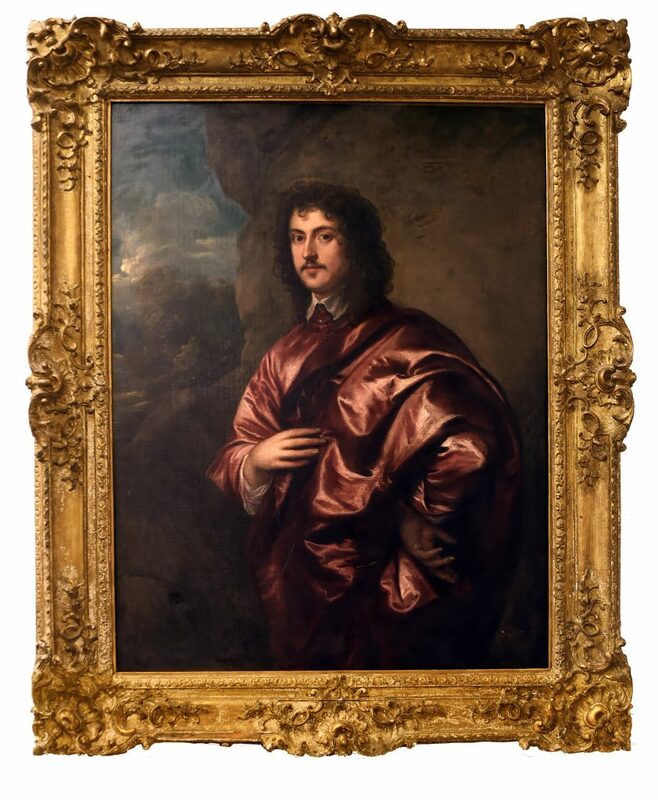 Lot 110 is estimated at just 200-300, but it has around considerable interest. This is a small house contents auction on the premises at The Highlands, Glounthaune, Co. Cork for the estate of the late Peter Rota. It comprises antique and decorative furniture, rugs, collectible porcelain and glass, mirrors, clocks and household effects. The catalogue is online.